Pennsylvania EXP series weight indicators set the standard for New and Replacement applications. Attractive price point, weighing, counting, versatile weighing indicator. USB for both power and data. Uses proven main board and components for reliability. Available in three different versions, 7400EXP, 7500EXP or 7600EXP. 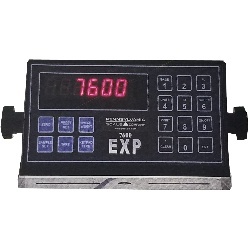 Pennsylvania Scale Company EXP Series Digital Indicators are designed to provide big performance in a smaller format. The USB-powered weight indicators are compact, rugged, versatile, and made in the United States. EXP Digital Indicators adapt to demanding applications and are ideal for permanent or portable needs. They provide high indicating power and at economical price point and feature a USB for power and data. We still recommend the stainless steel versions for longevity but if you're looking to save a little money, these EXP models could be a good choice for you. High Intensity RED LED display 0.56"
7400EXP -- Geared for truck and heavy capacity weighing in lbs and kgs with Gross/Tare/Net display.